Halten Sie Ihren Schlafzyklus und Ihre Wachphasen auf natürlichem Wege mit Hilfe von Swanson Melatonin unter Kontrolle! Dieses nützliche Hormon hilft Ihnen bei der Wiederherstellung normaler Schlafmuster, indem es dem Körper eine hervorragende antioxidantische Unterstützung bietet. Jede Kapsel liefert Ihnen 3 mg Melatonin. Anwendungsempfehlung: Als Nahrungsergänzungsmittel, nehmen Sie eine Kapsel mit Wasser eine halbe Stunde vor dem Schlafengehen ein. WARNHINWEIS: Da Melatonin Benommenheit verursachen kann, sollten Sie nach Einnahme dieses Produkts vom Führen von Kraftfahrzeugen oder dem Bedienen schweren Geräts absehen. Nehmen Sie dieses Produkt nicht während Ihrer Schwangerschaft, der Stillzeit, bei Autoimmunerkrankungen oder bei depressiven Störungen, sowie falls Sie unter 16 Jahre alt sind, ein. Suggested Use: As a dietary supplement, take one capsule with water one-half hour before bedtime. 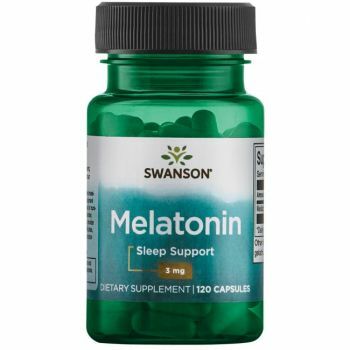 WARNING: As melatonin may produce drowsiness, do not drive an automobile or operate heavy equipment after taking. Do not take this product if you are pregnant or nursing, have an autoimmune condition or a depressive disorder, or are under 16 years of age. Consult your healthcare provider before use if you are experiencing long-term sleep difficulties, have a medical condition or if you are taking any prescription medications. This does not work for me. While I get a bit sleepy after taking it (my eyes also dry a bit) I can't sleep continuously during the night. I keep waking up, severely disturbed by nightmares or bad thoughts. It does not happen without Melatonin (only if I'm sick). I did not experience this with Melatonox from Dietmed, maybe because Melatonox also has Valerian and tryptophan? A friend gave me Swanson 3mg Melatonin to try. I am in my mid sixties and have spent most of my life almost nocturnal. Tired all day and wide awake from about eight in the evening till dawn. The Melatonin is brilliant, I now sleep like a normal person. I take 3mg about two hours before I want to sleep (around 10 in the evening) I sleep every night and awake refreshed in the morning. Other points that I have noticed, my body cools instead of being overheated all night, I do not itch all over once in bed, I am so relaxed that sleep comes easy. 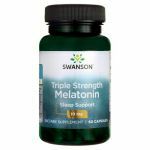 I do not get restless legs syndrome with Melatonin which has always been a problem with other over-the-counter sleep aids, neither do I have nightmares which are sometimes associated with Melatonin. If it suits you, then you have a wonderful, gentle answer to insomnia. I will take this forever. Thank you so much for this product.